Colorado Gov. John Hickenlooper talks about his two terms as the chief executive of Colorado in his office in the State Capitol in Denver in December 2018. Former Colorado Gov. John Hickenlooper has announced he will seek the Democratic nomination for president in 2020, becoming the second governor to join a crowded field of candidates. In a short video released Monday morning, Hickenlooper pledged to fight what he referred to as a crisis that threatens everything America stands for, as a picture of President Trump flashed on the screen, "As a skinny kid with Coke bottle glasses and a funny last name. I've stood up to my fair share of bullies. Standing tall when it matters is one of the things that really drives me." In an interview with Colorado Public Radio, Hickenlooper said he has his own tactic for dealing with Trump's aggressive tactics. "You say back what they're saying, but you twist it just enough so the people they're trying to impress see the lunacy, the comedy in what they're trying to say," Hickenlooper said. "When their audience begins laughing at them, it drives most bullies nuts." The 67-year-old former geologist, beer brewer and mayor of Denver has been considering a presidential bid for some time. He often touts his state's solid economic growth, especially in rural parts of Colorado. Hickenlooper also points to his accomplishments as governor, such as Medicaid expansion, increased infrastructure and public education spending and overhauling state campaign finance laws. He also led Colorado through major challenges, including historic wildfires and floods, and a mass shooting at a movie theater in a Denver suburb. "I promised Colorado families that we would rebuild our communities better than before, and that just offering thoughts and prayers would never again be sufficient," said Hickenlooper, who served two terms as governor, in his launch video. In 2013, Hickenlooper signed universal background checks into law and a ban on high-capacity ammunition magazines, but his pro-business centrist profile could be a turn-off for progressives in the party. He's also been a strong supporter of Colorado's oil and gas industry, which is sure to be a point of contention for some Democrats. As governor, he was known to try to build consensus and compromise on tough issues tackling the state. He argues there's more Democrats agree on than disagree, and that he could be a draw for independent voters and disaffected Republicans. In an interview with NPR last month, Hickenlooper warned Democrats that the party needed to stand for more than opposition to President Trump. "I think there is so much frustration at the national level, and I think President Trump has created this, so that the one way that people can demonstrate quickly and firmly that they are against Trump is to show anger and really lash out — at either President Trump or someone — to demonstrate that they have the same values as the Democratic primary voters. And I understand, I feel that," Hickenlooper said. "But I think there might be a kind of a new silent majority of people that are also going to want to see achievement. Hickenlooper joins a field that now has 14 declared major candidates. He said that what sets him apart from his opponents is that many of them have spent long careers in Washington engaged in a "debate of words" while he's been focused on making his state function. 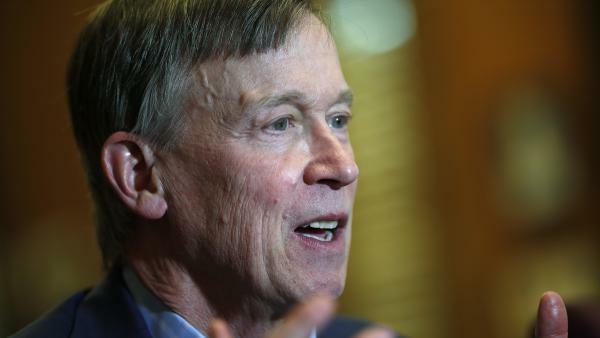 "I understand we need debate, but we also need doers," Hickenlooper told Colorado Public Radio. "I'm someone who, pretty much my whole adult life, has been spent bringing together talented teams of people and then working with them to accomplish real progressive change." While Hickenlooper isn't as well-known as some other potential challengers, he made that a clear lack of name recognition won't stop him. He formed a political action committee and began traveling for candidates during the midterm elections. This year, he's been making stops in Iowa, New Hampshire and South Carolina, where Democratic voters will get their first crack at weighing in on the field. Hickenlooper kicks off his campaign Thursday night in downtown Denver. He then heads on a two-day swing through Iowa, followed by a stop at the South by Southwest Conference in Austin, Texas. NPR political correspondent Scott Detrow contributed reporting to this story.